Yep it snowed in Atlanta! As a Atlanta wedding photographer I look forward to different. Wow this weekend was full of different since it started snowing Friday night in to Saturday morning. It blanked the northern Atlanta Area and into the city. This winter wedding was at the Payne Corley House. Krista & Michael Ganley the owners braved the weather early on to welcome the guest for the big day. The Payne Corley house is a wonderful historic house in Duluth, Georgia. It is a beautiful house built in the early 1800's but what makes the Payne Corley house so special is the staff! They are professional and so truly gracious to their clients. This wedding was shot early on Saturday morning when the snow was fresh. It was really a winter wonderland. It was so beautiful the way the snow covered the ground and accented the limbs on the trees. 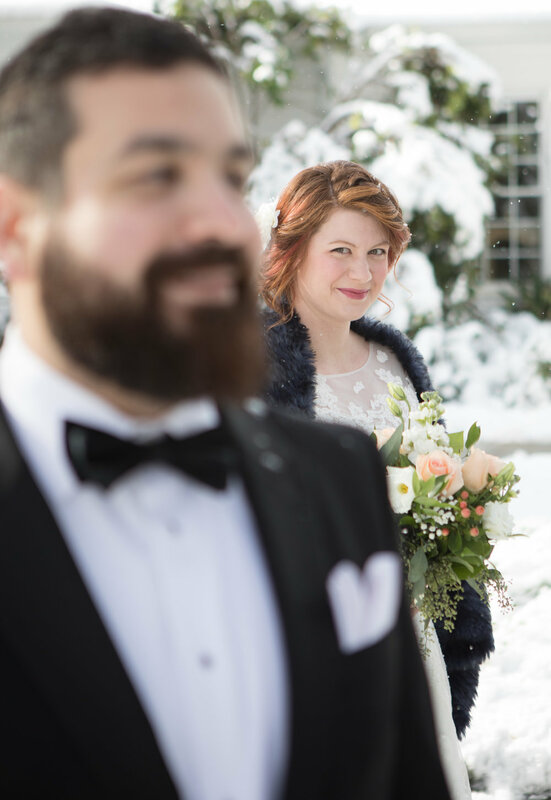 I was so excited to shoot in the snow and so was the bride and groom! We did a first look at the Payne Corley house. The couple was so sweet! They did a first look before any of the guests arrived at the wedding venue. We then went down the road to the city park and continued to shoot there. The bride was awesome!!!! She walked around in the snow with open toed shoes. Thank you so much for visiting this Atlanta wedding photographer's blog. I hope that you enjoyed it and got some wedding inspiration. I would love to hear from you. Please go to the contact section and drop me a line!